Motorhome and Caravan Info Australia » Blog Archive » What is a solar regulator and what is its job? « Why are my motorhome / caravan batteries going flat? So what does a regulator do? If we were to look at the job description of any solar regulator, the first item (and in some cases the only function) is to prevent the battery bank from being over charged. The regulator does this by simply disconnecting the solar panels from the battery. So at a really basic level, the regulator is just a switch. It is however a switch with a brain. Clearly we want the regulator to disconnect the solar panels only when the batteries are fully charged. To do this it must employ some intelligence and have some understanding of battery technology. The dumbest of regulators simply watch the battery voltage until it reaches the regulation point (battery maximum voltage) it then switches the panels off. So this is the three stages that we hear about when the sales people are trying to convince us to pay for a smart or “three stage” solar regulator (or battery charger). Bulk – push as much power into the batteries as possible. Absorption – control the charge to hold the battery voltage at a point for an hour or two. Float – maintain the battery at close to full charge by controlling the charge and holding the battery voltage at a preset point. By adding a shunt to your system, the regulator can “watch and record” the power that you use from your batteries. This allows the regulator to have a complete picture of the solar/battery system. If it can “see” all the power that is going into the battery AND all the power that is coming out of the battery, it is not difficult to calculate how much usable power remains in the battery (assuming you have told it how big the battery is). The PL series display this information on an often misunderstood screen called the SOC% (state of charge). A simple solar regulator can be purchased for about $25. It will tell you nothing about what it or your batteries are doing. It will have just three simple terminals to connect and will function perfectly for years. Alternately, you can spend $300 – $400 on an “all singing, all dancing” regulator that will tell you everything about the status of your electrical system and do everything except cook muffins. I think the important thing is to know what your regulator should be doing! Footnote – Plasmatronics has recently announced their new regulator, the Dingo. This shares many of the advanced features of the PL series and has the advantage of regulating on the positive side and having a nice fully enclosed case. This entry was posted on Wednesday, September 23rd, 2009 at 12:52 pm	and is filed under Caravan, Motorhome, Power, Solar, Technology. You can follow any responses to this entry through the RSS 2.0 feed. You can leave a response, or trackback from your own site. , this way the shunt will pick up the imput and the pl 40 will still see a charge???? is that enough or should i have fuse as well?? Q1 – NO, do not connect the charger to the solar input. You should connect it to the battery via the shunt. 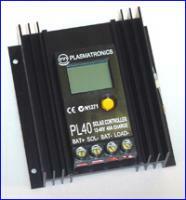 See the PL40 install diagram for full details. Q2 – without knowing the specifics of the charger – I can’t say. Slight gassing is ok but heavy bubbling on float is not. I would check with the battery manufacturer to see what their recommended float voltage is and make sure it is not being exceeded. Q3 – that is fine. The load terminal of the PL40 will handle 5amps. I run my fridge from this terminal, it has the advantage of providing separate daily data for this terminal – so I can see how much power my fridge is using each day. 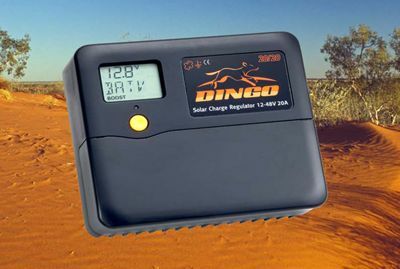 Q4 – Circuit breaker is fine (in fact much better than a fuse – large fuses are expensive and hard to find in the middle of the Simpson Desert ). That is a very good price for those – just over $3/w. Thanks for the Questions John! Hobohome and her crew have been travelling Australia for 15 years, 9 months, and 21 days.